I live in New Mexico where adobe homes are the norm. 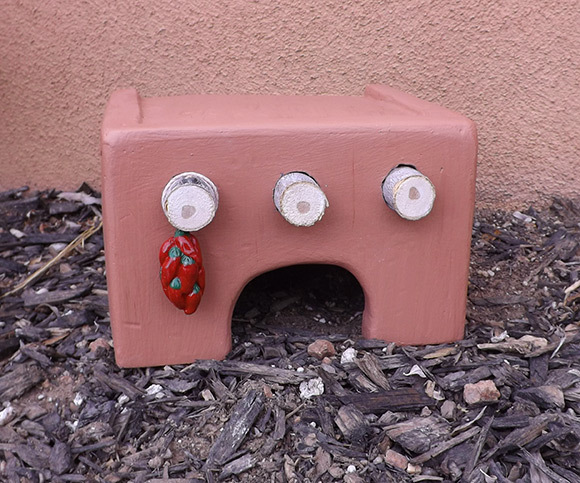 As a gift for a friend who both likes toads and grew up in Santa Fe, I made an adobe toad abode. I thought about a lot of ways to make this before I started. When you look up toad homes, they often recommend just flipping over a terra cotta pot and making a little opening so the toad can get in. I wanted mine to be more custom. 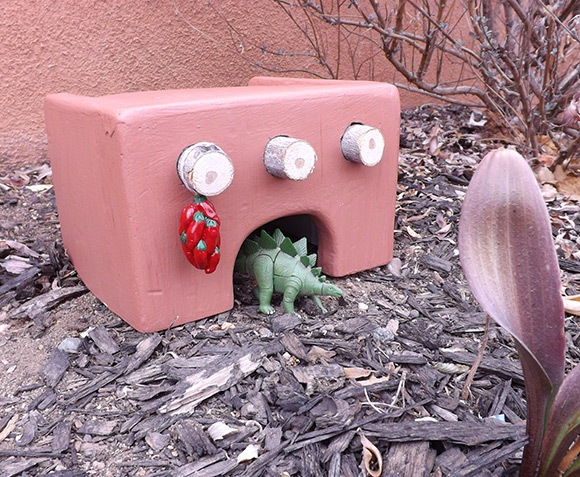 I have seen square terra cotta pots, but I was worried I would crack it trying to cut the door out. Instead I went with making it out of plaster of Paris. I made a quick mold out of cardboard. It was pretty sloppy so when the house came out I had to sand it a fair amount, but that's part of the charm of the Southwest, everything out here is a little DIY. I painted it with acrylic paint, then glued on the wood vigas. For the final touch of Santa Fe, I made a chile ristra out of sculpey to hang from the vigas. Once baked, I sealed the ristra with clear acrylic nail polish. It's winter so any frogs or toads that would be in NM are hibernating, but hopefully with its new home in Maine, come springtime, there will be a toad waiting list to live in this one of a kind adobe home. UPDATE: Unfortunately due to poor packing on my end and rough handling from USPS it didn't survive the trip to Maine. I still like this idea a lot so I may try to make a stronger one in the future, plus add more turquoise and howling coyotes.